Arrive in Beijing and airport pickup. Visit to the Tiananmen Square which is the largest city square in the world, bordered by the Great Hall of the People and Chairman Mao’s Mausoleum, then tour the Forbidden City, the complex of imperial palace, which was home to the Emperors for over 500 years. Grand halls and courts gradually give way to more intimate domestic quarters, giving an insight into the pampered isolation of the emperors. After lunch, enjoy foot massage at Traditional Chinese Medicine Center. Then we will visit the newly renovated Niujie Mosque, which is structurally based on traditional Chinese wooden palaces, yet adopts a typical Arabic-style of decoration. First built back in 996, the mosque has a history that stretches back over a thousand years, in which time it has undergone numerous refits and extensions, and has greeted Muslims from all over the world to worship. Do shopping at Muslim Super Market (if we have enough time). Enjoy Acrobatic Show at night. Check into hotel after dinner. Visit to the Jade Museum. Today is the highlight of our China tour, the climbing of the Great Wall of China. In 220 B.C., under Qin Shi Huang, the first emperor of China, sections of earlier fortifications were joined together to form a united defense system against invasions from the north. Construction of the great wall continued up to the Ming dynasty (1368–1644), when the Great Wall became the world's largest military structure. Its historic and strategic importance is matched only by its architectural significance. Lunch at a Muslim restaurant near the Great Wall. Do shopping at Burning Cream Center. Photo stop at the Olympic Stadiums – Bird Nest and Water Cube from outside. Enjoy special dinner with Peking Roasted Duck at Ziguangyuan Restaurant. It has 6 branches in Beijing, one of the famous Muslim restaurants with history of more than 30 years. The roasted duck is very popular here. Free shopping at the famous Wang Fu Jing Shopping Street and visit to the Night Food Market which has many halal snacks. Transfer to the airport in the morning and board your flight for your sweet home. HOME SWEET HOME. ALLAHAMDULLILAH. A SAFE JOURNEY HOME. Note: Itinerary may be amended by tour guide owing to unforeseen circumstances but places to visit remain the same. Free of charge for children below 2 years old. 2) All above rates are based on adult number. 3) All above rates are not valid for student groups. 4) A cost make-up fee of USD50 pp / day will be preceded for no-show pax during the tour. 5) A surcharge of USD30 pp / shop will be preceded for duration less than 50 minutes’ stay or cancellation on tourism shopping stops. 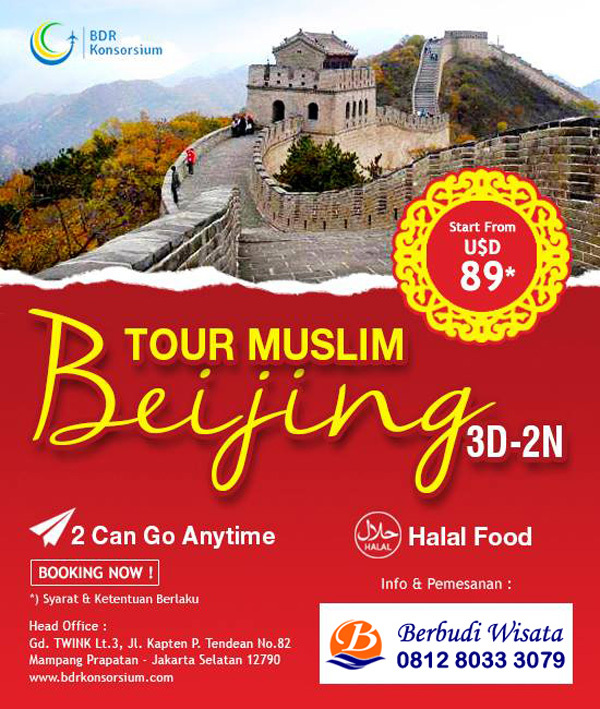 0 Komentar untuk "Tour Muslim Beijing 3D2N"